Dogs that spend time outside are often bothered by biting flies. Are you looking for ways to protect your pet from these annoying insects? This is a guide about keeping flies off your dog. I heard a lot of home remedies about how to keep flies from biting your dogs ears. I put on lavender scented baby oil and the flies are not bothering them. My dogs are being eaten up with flies and gnats, They are outside dogs. Any suggestions? Try a drop or 2 of clove oil on dog collar. Flies hate cloves! You do need to talk with your Vet to prevent pests. 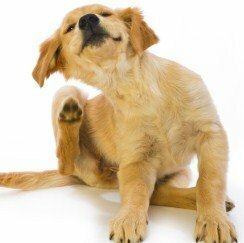 If the flies chew along the dogs ears, vaseline applied to the edges of the ears can help it to heal. But if you dont prevent the pests you will never get ahead. My puppy is a 1 mouth old. I gave him a bath, but he still have flies on the back of his ears and head. Please help me with my puppy. The flies on your puppies ears can be stopped by putting Vaseline petroleum jelly on his ears. The ears will become inflamed and infected unless you protect them. What can I do about flies biting my dogs ears? You can put Vaseline on them. But you need to reapply it on a regular basis. Some on the flea and tick products work well too. Keep your pet inside during the hot weather helps a lot, too. How do I keep flies off my dog? Skin So Soft works as the previous post mentions BUT you have to mix it with 5 parts water to one part Skin So Soft. It works great to for killing fleas. Rub it into the fur and down to the skin. Do not let your pet lick it or apply it around his face. Make several fly traps and put them around the outside of the kennel (about 10 feet) this will kill most of them. Then keep antibiotic ointment on the ears yo help them heal anf to keep as ny flies from biting. We have one outside dog that is being bitten unmercifully by the flies this year. She is bleeding on her back and ears. Skin so Soft did not work. I had heard rubbing rosemary on the dog would help and I tried that, but it only gave brief relief. I had made some rosemary and garlic oil out of olive oil. I was desperate and rubbed some of this over her and all afternoon the flies have left her alone. Is this safe to continue using? Dear Lord bring your dog inside. If it's bleeding it may have fly larvae developing into maggots and needs to see a vet. Try Advantix and keep it's area as clean as possible. Swat, you can get this at a Tractor Supply store. It work on my Husky's ears. My dogs are being pestered by flies biting their ears. Will my dog get sick from the fly bites? How do I keep the flies off my dogs? I read that putting Vaseline on the dog's ears can help protect them. I have had that problem with my Dachshunds and that's what I did. I also picked up the poop more frequently which drew the flies. I have two Huskies with flies biting their ears, nose, and paws. I used a Troy fly repellent cream I've bought, but it doesn't seem to be doing the job. What do you recommend? I hear you guys keep mentioning this Skin So Soft body oil by Avon. Does it have to be that brand or can I use Royal Almond body oil? How do I get rid of flies? They are biting my 2 dogs' ears and paws, etc. We have chooks (chickens) so they could be attracting them. I have tried Vaseline, petroleum jelly, and canola oil on the ears. I also spray apple cider vinegar, Listerine, etc. around. Any hints would be useful. I have always used Skin So Soft lotion from Avon on all of my dogs after giving them a bath or also in the summer to keep fleas and flies away.